Dirt and grime are easily removed! 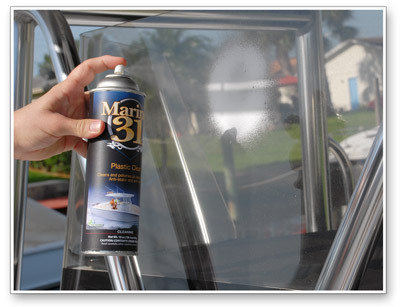 If it’s made of plastic, Marine 31 Plastic Care will improve its appearance! Micro-cleaning agents encapsulate dirt and grime while the thick foaming formula ensures scratch-sensitive finishes don’t get damaged as you wipe them clean. A built-in protectant blankets the surface with a thin, UV-protective coating that repels dust and dirt while resisting finger prints and smudges. What more could you ask for in a boat plastic polish? 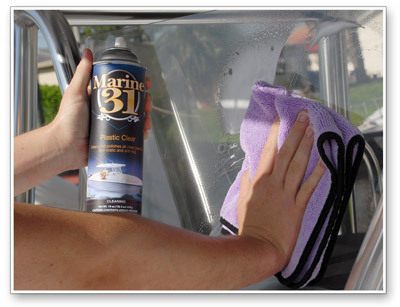 Marine 31 Plastic Clear reduces glare and fogging on clear plastic windshields and instrument clusters. A lot of time was spent in the Florida sun to ensure Marine 31 Plastic Clear left a perfectly clear finish free of streaks and haze. Regardless of the surface, Marine 31 Plastic Clear dries clear and leaves an anti-static, anti-fog, anti-glare, crystal clear coating. Regular application of Marine 31 Plastic Clear will keep plastic surfaces looking new, not to mention crystal clear. Shake well and ensure surface is cool to the touch. Hold can upright 6-8 inches from the surface and depress button. Wipe surface dry with a soft, clean microfiber towel. A second application may be necessary for heavily soiled surfaces.